Cahuita is a small town located on the exotic Caribbean Coast of Costa Rica. It has three sandy with warm calmed water and the popular Cahuita National Park, which is the most visited park in the country, mainly because it's amazing tropical rainforest and its fabulous coral reefs. Cahuita features no more than two avenues and five roads that lead to the beach and its neighboring town of Puerto Viejo which offers a wide variety of hotels, colorful bars and restaurants. The Cahuita National Park is located in the Basal Tropical zone of the Atlantic region and features 1,067 land hectares and 22.400 marine hectares including white sand beaches, a tropical forest and its turquoise water. This National Park is one of the most important conservation areas in the country; it was created to protect the plants, fauna, coral reefs and many marine ecosystems and its amazing panoramic beauty. This area offers a lot of attractions and activities in a very lied-back ambience. Water sports are the main attraction of Cahuita. A great place to go surf is the Negra Beach, a black sand beach close to town. Snorkelling around the Coral reefs its best during the months of March to May and September to December when this side of Costa Rica receives less rain fall. Blanca Beach is also a good option: its white beach, strong tides and big waves are on one side and the Suarez estuary, and make this beach a beautiful spot to go surfing, swimming and scuba diving. 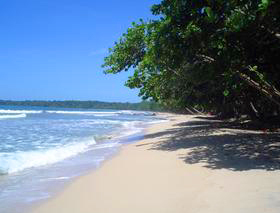 Visitors can also visit Puerto Viejo, which is a small and colorful town located just half an hour away from Cahuita. Nigh-life on Costa Rica's Caribbean Coast is very exciting; reggae music and a really lied- back ambiance are some of the characteristics of this zone.